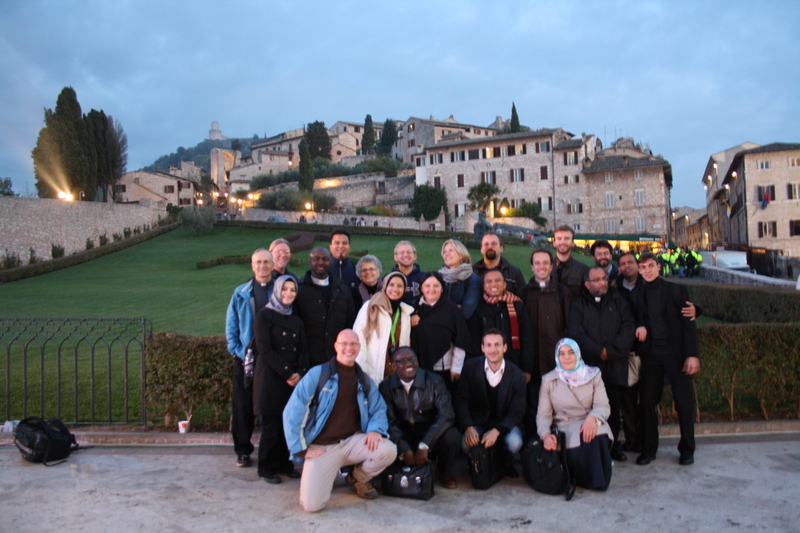 The Lay Centre at Foyer Unitas, in collaboration with the new Pope John Paul II Center for Interreligious Dialogue, planned a day trip to Assisi on 27 October 2011 to join Pope Benedict XVI and world religious leaders – and a few secular agnostics – in a day of pilgrimage toward peace. Our group included seven from the Lay Centre, six Russell Berrie Fellows and alumni, and one who could count for both. Additionally, we were joined by Rev. Tom Ryan, CP, of the Paulist Office for Ecumenical and Interreligious Affairs; Anna Maria Kloss, wife of the Austrian Ambassador to the Holy See; and seven other pontifical university students, including two from the Gregoriana’s late Interdisciplinary Center for the study of Religion and Culture. We were 24 people representing 16 countries, including: Austria, Belarus, Bosnia i Herzegovina, India, Indonesia, Israel, Italy, the Netherlands, Nigeria, Philippines, Poland, Portugal, Rwanda, Turkey, the U.S., and Venezuela. Our day began at 0500, enough time to get up and ready for an 0600 departure by tourbus, for the 3 hour drive to Assisi. At a coffee break on the way, we ran into the Turkish Ambassador to the Holy See. After arrival in Assisi we met up with our local guide and Lay Centre alumna, Lori King; Dr. Marian Diaz and staff of the U.S. Embassy to the Holy See. The schedule of the day was relatively light. At 1030 the morning session at the Basilica of Santa Maria degli Angeli, in the valley below Assisi proper, lasted for a little under two hours. We then made our way up the hill to a restaurant near the Basilica of Santa Chiara (St. Clare) for lunch. After lunch a leisurely stroll took us to the other end of town, to join a World Youth Day in miniature going on in the lower piazza before the delegates arrived. The closing event started at 1630, and was over in time for us to get a quick pizza and be on the road to Rome by 2000. Assisi was, if anything, quieter than many of my visits. Expecting large crowds for the event, most who did not have tickets stayed away, so in fact there was just a right amount – those with tickets admitted into the venues, and then only locals from Assisi and nearby towns lining the roadways or in the piazza outside the church. It was a welcome change from the unruly hordes that accompany papal events in Rome. Inside the basilica in the morning, we were seated barely 15 meters from the platform, though at an obscure angle. In the afternoon, the lowere piazza was filled, but it is not very large, and we were seated at just the place where the pope, patriarch, and archbishop disembarked their shuttle. At one point, just before the delegates arrived for the afternoon program, one of our company had gone looking for water. We wanted to find him before it was too late to re-enter the piazza, but were barred from exiting by security as the delegates who were coming on foot were about to arrive. As we watched the nearly 300 religious delegates enter the piazza, wondering where Muhammad had gone, there he comes in the middle of the delegates procession, engaged in deep conversation with a professor from Sarajevo! It looked so natural, that security did not even think to stop him. It was classic, and again, left me wishing I had had a working camera with me! In the end, the trip came together wonderfully, especially in that most of it was put together in only a week. It is a once in a decade event, made well worth it with the companionship of friends and colleagues in dialogue. For three days this week, the Angelicum, the Lay Centre, and the Russell Berrie Fellows hosted the board of trustees of the Russell Berrie Foundation, which grants the funding and direction for our Fellowship. 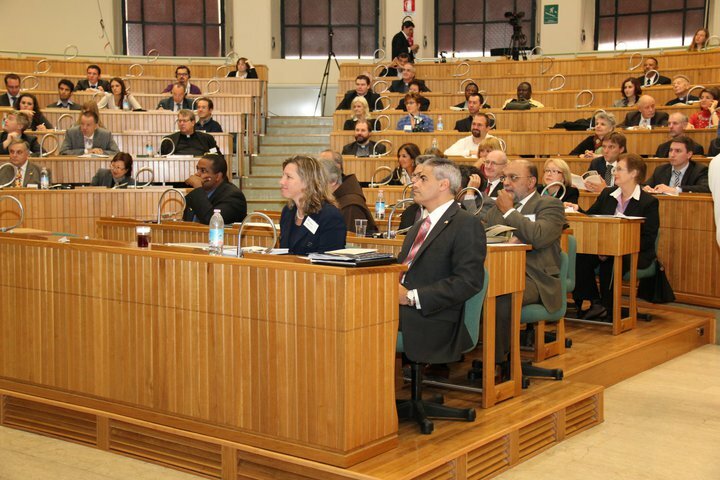 It was the first time the full board had come to Rome to see first-hand how the program was progressing. 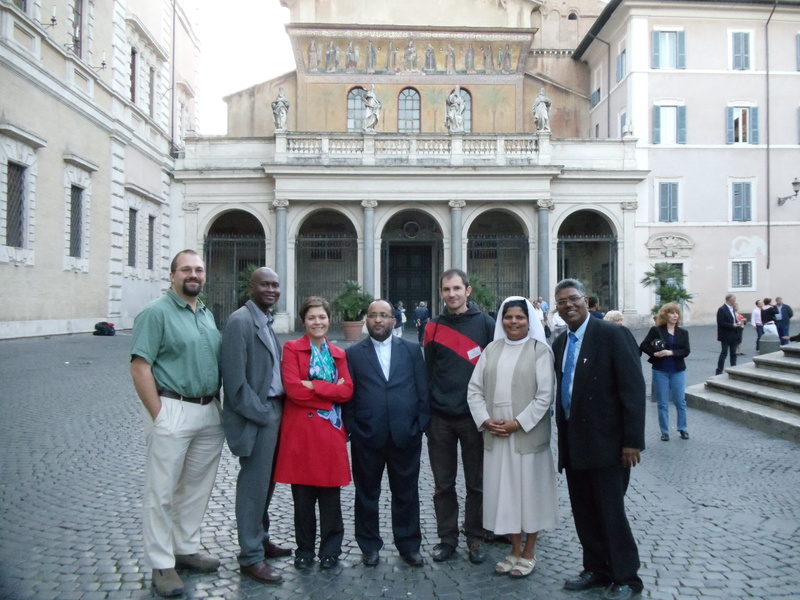 In addition to the 20 Fellows (Ten each year for two years) funded, the Foundation also provides for the John Paul II Center for Interreligious Dialogue at the Angelicum, supplies visiting faculty for six intensive courses this year, and the annual lecture in Interfaith Dialogue featuring a world-renowned speaker. The six trustees were friends, family, and colleagues of Russ Berrie, the successful New Jersey entrepreneur with interests ranging from Catholic-Jewish relations, to business leadership development, medical diabetes research, and fostering a Jewish renaissance. Angelica Berrie, his widow, is chair of the board. 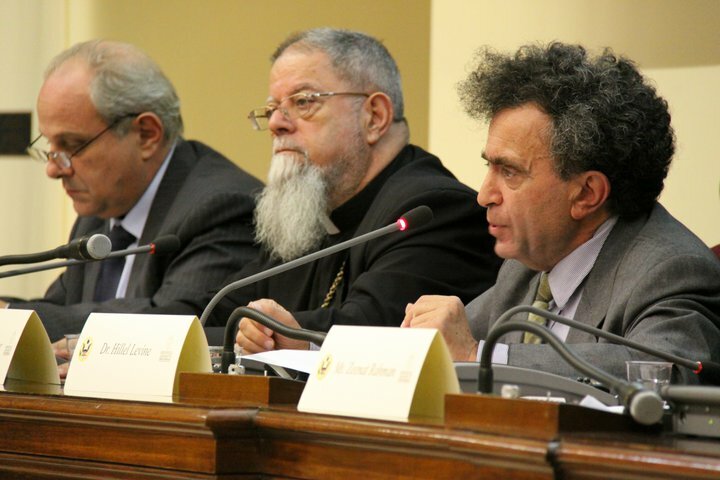 Three of the trustees had come to Rome in early 2005 to meet with John Paul II, and at that time met with some of Rabbi Jack Bemporad’s students. 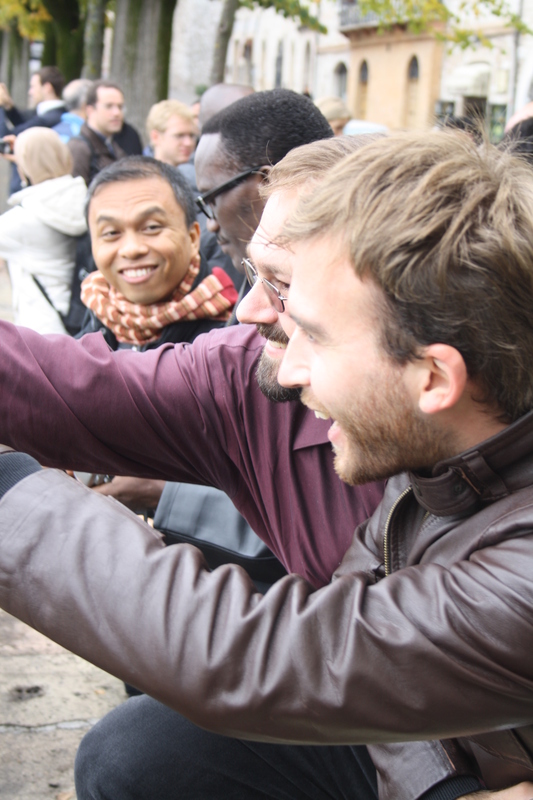 This encounter sparked the idea that became the Russell Berrie Fellowship in Interreligious Studies. Over lunch, one of the trustees told me that, as the son of two Holocaust survivors, he was completely surprised by his welcome in Rome on that visit and the attitude of these post-Vatican II Catholics. Not what he expected or had experienced in the past; he became a convert to the cause of dialogue. I had shared with him and then with the entire group that, being raised not only post-Vatican II but by parents formed mostly after the Council themselves, nothing could be more antithetical to Catholicism than anti-Semitism. It was in fact fairly late, in college, that I first encountered a history of the Church with the Jews that was anything other than the very positive relations we now largely enjoy, and it was a shock. For the man with whom I was speaking, his surprise had been at discovering my generation’s positive disposition. Several events gave the Fellows and the trustees time to meet and mingle, along with officers of the Angelicum and then at the Lay Centre. A more formal presentation was offered by four of us representing the two cohorts of current Fellows: Myself, Paola Bernardini (Italy), John Bakeni (Nigeria), and Taras Dzyubanskyy (Ukraine). 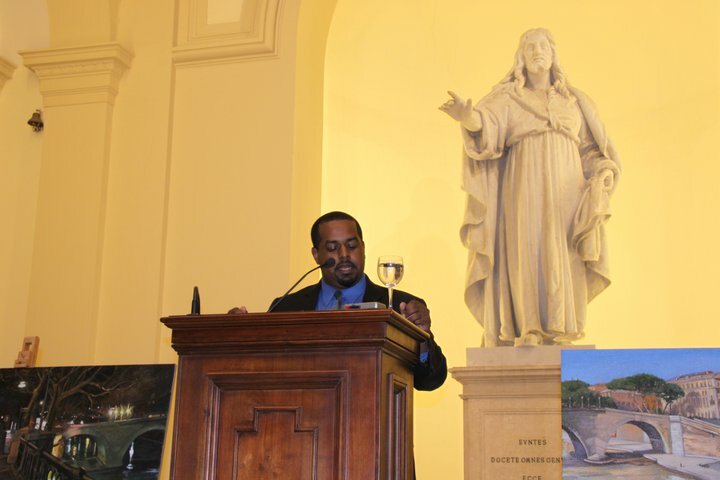 My remarks focused on three sections: 1) Who am I and what is my background in interreligious dialogue, 2) Why Rome and the Angelicum, instead of somewhere like Boston College or Notre Dame – places with stronger academic reputations and established Jewish-Catholic studies and resources for dialogue? And 3) Where is the future of our dialogue, and my role in it as a Fellow? Most people have heard my vocation story, or at least the early part of it. I distinctly remember where I was when, at the age of 7, I discovered that not all Christians shared the same Church. I was scandalized, even then, and vowed to spend my life working to heal the divisions. At about the same time I discovered that not everyone was Christian, but this delighted me and I determined to learn as much as I could about the world’s religions. But the question in the minds of several people is, Why Rome? Why Angelicum? There is the historical opportunity in the form of the personal connections between Russ Berrie, Rabbi Bemporad (who has been visiting professor at the Angelicum for over a decade) and Fr. Fred Bliss (former chair of the ecumenical section). It is not the only place where a Rabbi teaches on a Catholic theology faculty, nor the first. But it is where Karol Wojtyla got his doctorate in philosophy and where, for example, Cardinal-designate Archbishop Wuerl of Washington and Archbishop Dolan of New York did their studies while in Rome. The Angelicum is the second oldest of the pontifical universities, after the Gregorian, and the only one which offers the specialization in ecumenism or an entire programme in English – making it more accessible to several of the countries where the growth of the church is strongest, in Africa, India, and southeast Asia. The program here offers exposure to a broader cross-section of the church and future episcopate than would be the case at even the best U.S. or northern European university. Just being part of such a diverse fellowship, often being one of only two or three North Americans or native Anglophones in a class offers insight to the dialogue within the church as well as dialogues ecumenical and interreligious. 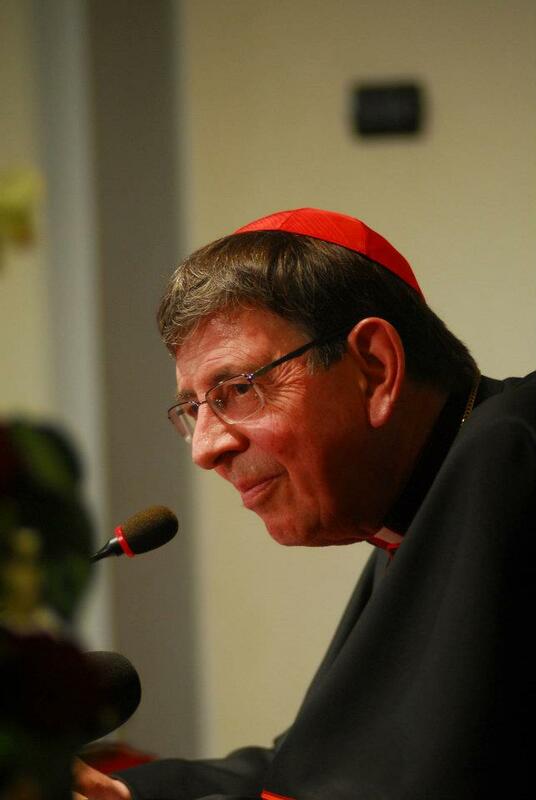 As I noted in my remarks, the Fellows represent the demographics of the Church better than the College of Cardinals does, though we need more from Latin and South America. One of the most interesting comments for me came from our sole Latina, Claudia, from Chile. Leadership was a theme repeated by the trustees and staff of the Foundation during our orientation and meetings. As a lay person, she says, she had never considered what leadership in the Church would mean, for her. Obviously, she will not be bishop or a religious superior, and this is true of most of us. Even after having studied theology for several years, and having been invited to Trent for an international symposium in her field, she had never been asked by anyone within the Church to think about her leadership role. Remarkable. The final full day of our Russell Berrie Fellowship Orientation program began with a trip to the Centro Pro Unione, the historic library and ecumenical center that sits above the Piazza Navona. Director Fr. James Puglisi, who also serves as director of the ecumenical section at the Angelicum and Minister General of the Franciscan Friars of the Atonement, lead a presentation on the academic responsibilities and processes of the section in addition to an introduction to the Centro. This was followed by a roundtable discussion on Dignitatis Humane with our previous guests Thomas Casey, SJ and Miguel Ayuso Guixot, MCCJ and introducing Maltese Dominican Joseph Ellul, who is an expert on Islamic thought and its encounter with eastern Christianity. The rest of the day was spent in administrative issues and a group discussion around the praxis of interreligious dialogue, and a closing celebration of the Eucharist. One of the interesting aspects of the week was the number of priests living in the house. Obviously, the Lay Centre only has one or two priests for Eucharist, whoever has been invited to preside. It is always a little strange to have as many concelebrants as other members of the assembly! This provided an interesting side discussion with one of my cohort, a presbyter. If a priest is celebrating the Eucharist, must he do so as presider or concelebrant, or may he do so as a member of the assembly – “in choir” in other words. And if so, does it “count” if the priest feels an obligation to celebrate mass daily? There is clearly a movement that seems recent which indicates a priest should vest and actively concelebrate every time he is at mass. At the same time, one need look no further than papal liturgies at St. Peters to see that often, most priests and bishops are attending in choir only, not concelebrating. As at home, it seems some are asked to concelebrate for certain occasions, but it should not be assumed – and it certainly does not necessitate a private mass to be celebrated later! I know it is not about interreligious dialogue, but, thoughts, anyone? American Dominican Robert Christian joined us to begin the day with the Eucharist. One of my professors at the Angelicum, Fr. Christian and I share a ministry in common – for a few months at the beginning of our service to the church, we each served as campus ministers in the Archdiocese of Seattle. He, at the Newman Center at University of Washington for a few months in 1985 and me at the Shalom Center at Western Washington university for a few months in 2003. His specialty is St. Thomas and sacramental theology, and is an excellent preacher. We spent the morning at the Great Mosque of Rome, lead by former Lay Centre resident Mustafa Cenap Aydin of Turkey, and co-founder of the Istituto Tevere Centre for Dialogue. Unlike the synagogue and the many churches of Rome, the mosque is well outside of the historic centre and difficult to get to without a car. The design incorporates colors of classical Rome, familiar Arabic elements, and modern adaptations, including pillars in five parts to recall the five pillars of the Islamic faith and call to mind palm trees that might be found in Mecca. Various nations contributed parts of the mosque, from the careful mosaic to the suras encircling the worship area. The use of hidden natural light and the local colors mix with the exotic elements to provide a meditative space that can handle 2500 worshipers. 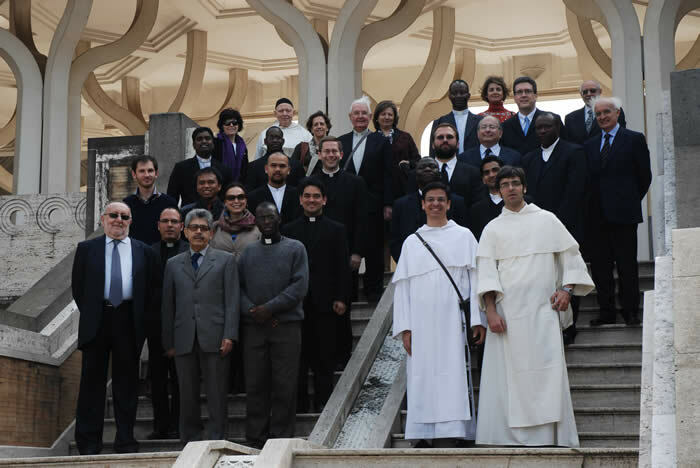 Our afternoon brought us back to the centre and across the river to PISAI – the Pontifical Institute for the Study of Arabic and Islam, where president Fr. Miguel Ayuso-Guixot, a Spanish Comboni Missionary of the Heart of Jesus gave an historical and theological overview of the encounter between Christianity and Islam. One of the oft-repeated metaphors of the week was one that Padre Miguel spent a few moments on – we are not looking for a “melting-pot” so much as a “mixed salad” when it comes to interreligious dialogue. After a meander through the streets of trastevere, we met with Dr. Paolo Mancinelli of the Sant’Egidio community, one of Church’s best known lay movements, whose focus areas are direct work with the poor, peace and justice, dialogue and prayer. Paolo introduced us a little more to the work of the community, including Pope Benedict’s recent lunch with the community at their soup kitchen near Sant’Egidio. We concluded the evening with evening prayer with the community at the church of Santa Maria in Trastevere, a 12th century church built atop the foundations of its 4th century former self. Around the corner was diner at Trattoria degli Amici, a now-familiar restaurant run by Sant’Egidio community and disabled friends. Good food and good company always make for an excellent discussion!